New York: A Lisa Drew Book/Scribner, 2002. 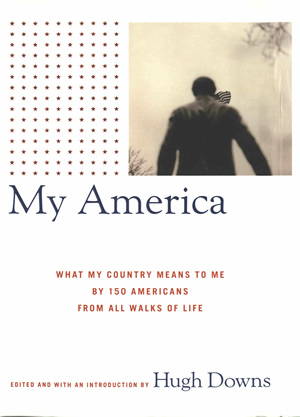 This is the hardcover edition of My America: What My Country Means to Me by 150 Americans From All Walks of Life edited by Hugh Downs, published by Scribner in 2002. Tony Hillerman contributed an essay, which begins on page 111. In his typical down-to-earth style, Hillerman provides a page and a half of counterpoint to the political fear-mongering that took place after the terrorist attacks of 9/11/2001 and the subsequent anthrax scares: "I'm an elderly fellow with memories of Pearl Harbor, of the rush to recruiting offices, of getting myself blown up by the Germans in that cold winter of 1944-45. But I have no memories of Americans afraid--even when there was a legitimate reason for fear." This hardcover book has a dust jacket. The cover design is by John Fulbrook III, and the cover photo is by Dan Winters. The front cover features a black and white photograph of a man wearing a jacket, facing away from the camera. To the left of the photo are 150 small stars printed in red metallic. The book title is below printed in blue, with the subtitle beneath printed in red. The editor's name is in the lower right corner of the front cover. The back cover displays a list of contributors, printed alphabetically by last name, in blue. Binding: Quarter bound, white paper and blue cloth. Title, author name and publisher imprint lettered in gold on spine.